High Quality Content by WIKIPEDIA articles! 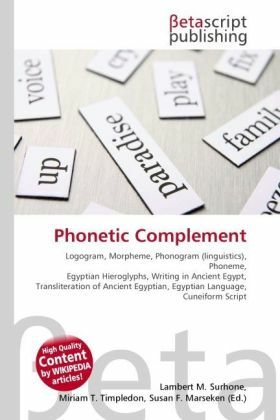 A phonetic complement is a phonetic symbol used to disambiguate word characters (logograms) that have multiple readings, in mixed logographic-phonetic scripts such as Egyptian hieroglyphs, Akkadian cuneiform, Japanese, and Mayan. Often they reenforce the communication of the ideogram by repeating the first or last syllable in the term. Written English has few logograms, primarily numerals, and therefore few phonetic complements. An example is the nd of 2nd 'second', which avoids ambiguity with 2 standing for the word 'two'. Hypothetically, if English had a more developed system of phonetic complements parallel with the scripts mentioned above, there might be a convention of writing 2ble for 'double', 2ple for 'couple', 2ary for 'February' (the second month), b2y for 'binary', 2r for 'pair', o2r for 'other' (which historically meant 'second'), 2in for 'twin', 2ni 'Gemini' ("the Twins").